Gary keeps it local, with your chance to talk about your favorite high school, college and pro teams of interest to Delmarva. 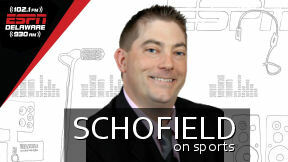 Call Schofield on Sports at 302-422-2428. How the Sixers Beat Brooklyn, key matchups with Toronto and predictions. Conversation wtih Ricky Stenhouse, JR.
Sandra Lee and Gary Schofield discuss Ricky\'s reputation on the track, where Ricky finds joy off the track and his season so far. Arrieta out of line? Was it or Wasn\'t it a goal? Who would Ricky Stenhouse, Jr. pick in the draft and what Philly fans shouldn\'t do tonight! Enjoy! We talk clunkers, a bounce back and do the Sixers really have an easy road through the end of the regular season? The Big man is back, same old story against Cleveland oh and Jon\'s favorite football team has some new additions! The Good, The Bad and the Ugly of the week that was, concern over Embiid? and a great State Title game set up for Saturday! In The Huddle preview, we talk Giants/Browns deal, Dan says trade OBJ. Listening to Gary and Coach try to talk about Robert Kraft\'s charges is interesting, AB situation in Pittsburgh, post season brackets in HS Hoops and The Masked Singer streak, did it continue? Manny Machado signing with San Diego reaction, Josh Webb from DMV Sports Network hangs out talking Machado and Wizards B-Ball, is there a plan?!? Kaepernick settlement, Harper Decision? Winners and Losers of the Week and What to Watch For, plus first time caller Paul checks in! Disappointing loss to Boston, Early impressions of the new starting lineup and looking forward to the All Star Break. How will Harris fit with Sixers and how it sets them up for the postseason. Sorry but the first couple minutes of our conversation got cut off, enjoy! Gary talks with ESPN Baseball Analyst Tim Kurkjian about free agency, what\'s good with the game and the Hall of Fame. NFL Divisional Playoffs, is Coach rooting for the Saints?!? Steph Driver from SBNAtion and BroadStreetHockey.com gives us the lowdown on Hakstol\'s firing and how the team will be different under interim Head Coach Scott Gordon. And is it too early for Carter Hart! Follow Steph @StephaliciousD on Twitter! Jon dropped by to talk about Sixers Opening Night and of course we had to talk high school football. Coach talks NBA, NFL and Fantasy Football and Bold Predictions! Matt Lilly talks about his new role and the upcoming season for the Sixers G-League affiliate here in Delaware! Bo Jackson tells us about Bo Jackson Signature Foods Line, his guilty TV pleasure and you\'ll never guess what he did in a red rocking chair he got for Christmas, he was so much fun! Gary and Coach Smith discuss tonight\'s football game vs. Milford and the Polytech Girls Field Hockey 4-0 start! He hosts a podcast and dug up his lawn as a kid, good time! Ray gives us his prediction of the NFC East and talks about a big surprise from Eagles camp and of course, will Carson be ready for next Thursday? We meet Jack Ross with great information on how we can start taking advantage of sports betting here in Delaware. Baby Watch Continues, Harold\'s Called Shots? Is Gary right to be annoyed with GM Speak? Gary and Eric Sichau talk upcoming promotions for the Shorebirds at Perdue Stadium. Gary Defends Who?!?!? And Jeff From Seaford isn\'t so sure he\'s right! Martin discusses his delawareonline.com article that says the Eagles should have gone to the White House, plus says we should hedge our excitement about Carson Wentz\'s progress and what Mychal Kendricks\' release means for the Birds! Former WBOC Sports Director and current ABC 7 Sports Reporter Scott Abraham joined Gary live from Las Vegas to talk Game 2 of the Stanley Cup Finals, sorry the recording missed the first minute or so of the interview, but enjoy! Bilal describes the excitement of being drafted by the Chicago Bears and what his \"upside\" looks like to him! Larry talks Race Weekend in Dover and a great Dale Sr. story to boot! Gary Schofield and Larry Meli talk about the Delaware Blue Coats name change, new home and how you can live your basketball dreams, also what skills Gary has on the court! Today the #1 Bowler in the World joined Schofield on Sports, and Gary treated his son Jay to be a part of the interview! Gary and Steve Lapps talk Villanova\'s upset loss to St. John\'s, UNC/Duke preview and how much fun the tournament will be this year!